Should I Buy That Fixer-Upper? For people who love old houses — and love to work on them — the notion of buying a fixer-upper can be irresistible. Just think: You can snag a rundown place in a good neighborhood for way below market price, invest some time and money renovating it, and end up with a like-new house that's worth at least twice what you paid for it. Sounds good, right? Often, it is. But buying a fixer-upper can be fraught with peril. So before you take the plunge, make sure you have a realistic idea of what you're getting into. If people are unforgiving up front about assessing the costs of renovation, the value of the property and the neighborhood, and how much money they have, they can come out ahead and buy more house than they otherwise could ever afford. With that in mind, here's what it takes to make the purchase of a fixer-upper pay off. Figuring out what you should pay to buy a fixer-upper starts with a simple equation. First, add up the costs to renovate the property based on a thorough assessment of the condition of the house. Be tough with this estimate, which should include materials and labor — yours and other people's. Next, subtract that from the home's likely market value after renovation, drawn from comparable real estate prices in the neighborhood. Then deduct at least another 5 to 10 percent for extras you decide to add, unforeseen problems and mishaps that have to be dealt with, and inflation. What's left should be your offer. It's essential that the real estate contract include an inspection clause. At best, the inspection will assure you that the house is a good investment; at worst, it will help you back out of the deal. Often with fixer-uppers, it's something in between. The inspector will document a serious problem or two, and you can use the findings to get the seller to pay for repairs or negotiate the sale price downward. If the house needs significant structural improvements, many real estate experts recommend avoiding it altogether. That's because major repairs — plumbing and electrical system overhauls, foundation upgrades, and extensive roof and wall work — are usually "invisible" and hardly ever raise the value of the house enough to offset the cost of the renovation. The ideal fixer-uppers are those that require mostly cosmetic improvements — paint touchups, drywall repairs, floor refinishing — which generally cost much less to do on your own. New lighting fixtures, doors, window shutters, and siding, as well as updated kitchens and bathrooms, are also viable improvements. Falling in between structural and cosmetic renovations are major additions needed to bring the house in line with its neighbors, such as a family room or third bedroom in a community of three-bedroom homes. Such projects usually cost as much as or more than they return in market value (the exception to this is adding a bathroom, which can be worth twice as much as its cost). Sometimes it's possible to fold cosmetic improvements into a structural repair to increase the value of a fixer-upper. If you're replacing the roof, for example, you could add a skylight at the same time. Or you could install a bay window where there was dry rot in a wall. But you also don't want to over improve: For maximum resale value, remodeling investments should not raise the value of your house more than 10 to15 percent above the median sale price of other houses in your area, according to the National Association of Home Builders. In places where housing costs have run up significantly and are approaching a peak, even a fixer-upper that seems reasonably priced may be too expensive. A large-scale renovation job can take many months, if not years, to complete. Whatever renovation is required, it's usually most cost-effective when homeowners pitch in. "A fixer-upper is for people who are willing to be do-it-yourselfers, because that can save them a lot of money and they can have the pride of accomplishment themselves," says Fernando Semiao. Many of Semiao's clients can't afford a house in good condition in New Jersey's suburbs but "have the skills to hang cabinets, paint, spackle, install trim, build decks, replace windows, and even put on vinyl siding," he says. If you're not the hands-on type, be prepared to devote a considerable amount of time — months or even years — to closely supervising contractors. One of the most challenging aspects of purchasing a fixer-upper is paying for the renovation. Understandably, most people don't have much extra cash after making the down payment and paying closing costs, so coming up with additional money to cover repairs or remodeling can be difficult. For small projects, credit card debt is an option. Interest rates are high and the interest isn't tax deductible, but there are no up-front costs, such as appraisal and origination fees. It's also possible to borrow against the cash value in a 401(k) retirement plan, life insurance policy, or stock portfolio. In each of these cases, there's no credit check and the interest rates are relatively low — on par with that of a typical mortgage — but again, the interest is not tax deductible. By far the most popular funding choice for a fixer-upper is a renovation loan, either through a home equity line of credit or a mortgage. Home equity lines can generally be borrowed against 90 percent of the equity that the homeowner will have in the house after the repairs and remodeling are completed. 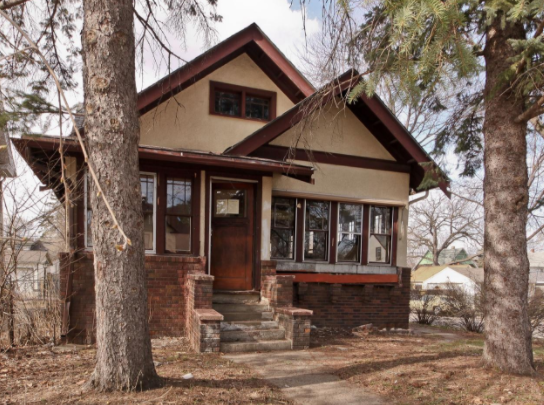 To illustrate: If a person buys a $250,000 fixer-upper with a down payment of $25,000, and the house will be worth $425,000 post-renovation, the homeowner will have $200,000 in equity. Even before the work is done, the borrower is eligible for a $180,000 home equity loan. The interest rate on a home equity loan is about the same as for a mortgage, but only up to about $100,000 in interest is tax deductible. In January, Jesse and Marie Goff bought a 1,400-square-foot contemporary house with a water view in Sausalito, California for about two-thirds of market value. The price was so low because the inspection found problems with the foundation, plumbing, and electrical system, and the house badly needed painting inside and out. The down payment exhausted most of the couple's budget, so they planned to first do cosmetic and design work — tear down walls to modernize the living space, put in a new kitchen, install wood flooring, and paint — before tackling the major structural tasks. "We decided to save up money to do the big improvements like the foundation later on," Marie Goff says. But many of the problems couldn't wait. A new kitchen, for instance, would have been damaged when they jacked up the house to do the foundation work later on. And not only were the pipes and fittings throughout the house in need of repair, but many weren't up to providing enough pressure to expand the supply network. As a result, months after the couple purchased the property, the walls and floors were still torn apart, the plumbing was turned off in parts of the house, the building was shored up pending foundation repair, and they had blown all the money earmarked for the initial cosmetic work. "That was depressing," Goff says. "We were living in the middle of what seemed like every problem imaginable." Goff acknowledges that they made some mistakes. "We didn't calculate how much money we had, and how much we might need if things were worse than we thought and had to be dealt with sooner than we hoped." In the years since, they've managed to whittle away at the renovation — which still isn't completed — by scraping together the cash to do things right, taking on most of the work themselves, and hiring outside contractors only when necessary and working closely with them. Despite the setbacks, Goff has no regrets. "It cost more than we expected and took much more of our time and work than we had anticipated," she says. "But when we're done, soon, this will be a house that we designed, in perfect shape and it's our dream house." How Much Of A Down Payment Do You Really Need To Buy A Home?